Hah, that’s awesome! Seems pretty UFO-ish to me. Howzit J-man, I have to admit, most folks don’t really appreciate the full meaning of the acronym UFO…Unidentified Flying Object. ok congratulations….. and yeah ive also seen a UFO. in the 90’s right here five minutes from the centre of Durban. So not only spotted in remote areas…. I got in touch with Mrs. Cynthia Hinds of MUFON who was coincidentally down here for a seminar at the time…. she followed up all the other peoples sitings of the same thing and agreed that it was a UFO… (her job was to scientifically prove that it could have been weather produced or somesuch…) Anyway tis like being part of some elite club dont u think? Mrs. Hinds said at the time that in her years of research she had found it likely that if a person saw ONE UFO, there was a greater chance that they would see another at some point. Weird…. Wow! do you know how to use all that technical stuff on computers, like adding one picture to another? sorry to disapoint u mate, but i think its fake. If you read the post, my dad took the photo and the only thing he knows about computers is how to turn it on! So as for it being a UFO, it most certainly is one, unless you can see exactly what it is! Not sure what it is it looks quite real but then it could be something else,not really sure what else though…..
Maybe it’s a true UFO!! Why don’t they come to Taiwan?? 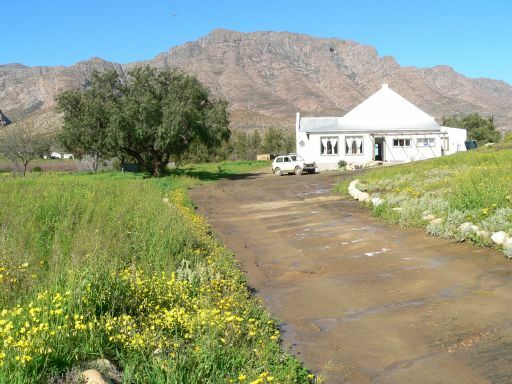 I regularly travelled through the Karoo from Stellenbosch to Oudtshoorn. 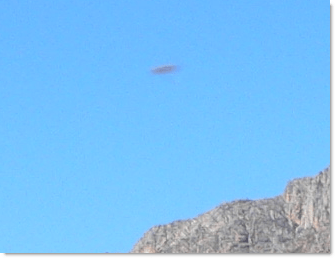 I have seen 2 UFO’s in the Barrydale region during the day. There is no explanation for what I saw. I do not neccesarily conform to the UFO theory … but what I saw cannot be talked away. Never seen one myself, but I have had people who worked for me who have. One was on his way back to Natal going through the Transkei, when he and his brother saw what they said looked like a train with its lights on traveling across the sky. They pulled up and there were three other cars pulled up at the same spot watching it traverse across the sky towards Durban. The other one was seen stationary at a Jo’burg goldmine taking up an area about a football pitch in size. There were only my friend and his black assistant who witnessed it, but the black man took to his heels and never returned to night shift work again. Hi. I am currently doing a school project on UFOs and I have seen a lot of pictures of them. That really does look like a UFO to me. Don’t feel like a weirdo because I believe In UFOs just as much as you do. Don’t let people tease you about what you believe is real and don’t ever stop believing Bro. wow. this is some crazy photo. i cannot say i havent seen a ufo becuase i have, i dont know if it is real but i know that nobody can explain to me on what i saw. so just keep believing in what u saw dude. Next Next post: How to properly use a credit card and save money!